Car collector plans a hands-on approach to showing his mid-20th century automobiles. In a boxy, 20,000-square-foot brick building on Pearl Street, self-described "old car geek" Tim Stentiford of Kennebunk keeps his collection of 35 mid-20th century cars. BIDDEFORD – Tucked in the midst of the city’s mill district is a time capsule of automobile history. In a boxy, 20,000-square-foot brick building on Pearl Street, self-described “old car geek” Tim Stentiford of Kennebunk keeps his collection of 35 mid-20th century cars. 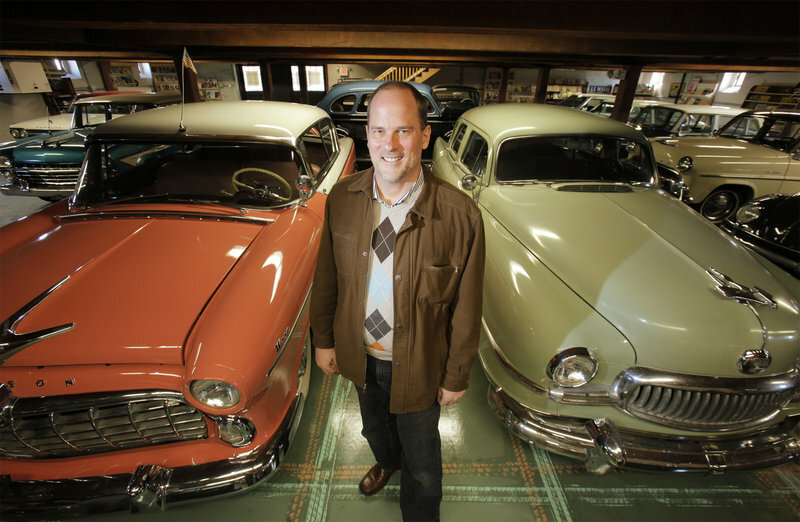 The vehicles, ranging from Studebaker Provincial station wagons and VW Beetles to Rambler Marlin hatchbacks and Nash Ambassadors, are the core of Motoropolis, a classic car gallery and museum that he plans to open to the public by the spring of 2012. Stentiford, 50, a former communications consultant, began his hobby as a collector when he was only 12. In recent years, he searched from York to Brunswick for the perfect building to display his growing car collection. He decided on the circa-1880 mill building because of its historic value and the city’s efforts to revitalize its mill district. City Manager John Bubier said Motoropolis fits well into the mill district’s master plan and enhances the diversity of activities in downtown Biddeford. “Tim has a really unique idea,” he said. Motoropolis has been in the works for over a year now. “My life dream is to create a destination, not just for car enthusiasts, but for students, locals and visitors,” Stentiford said. He plans to create a hands-on, interactive museum where cars will be accessible to visitors and not behind cordons. For Stentiford, Motoropolis isn’t just about the cars. It’s also about the stories that each vehicle embodies and the cultural history surrounding automobiles in America. Letting his black pug, Milo, hop into the front seat of a 1947 Crosley last week, Stentiford reeled off facts about the car as if it were a family member. Considered America’s first “green car,” the Crosley gets 58 miles to the gallon, Stentiford said. Built from 1939 to 1952, the car was aimed at low-end buyers and priced at $210 in 1940. 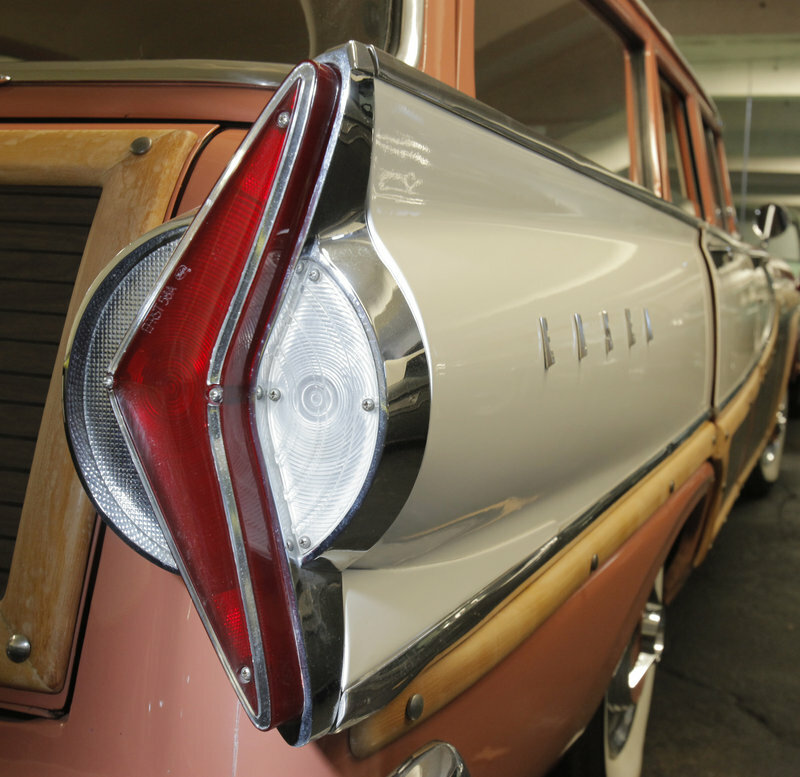 One of Stentiford’s favorites is a 1957 Nash Ambassador, which he calls “Pinky Brown” for its prominent exterior colors. 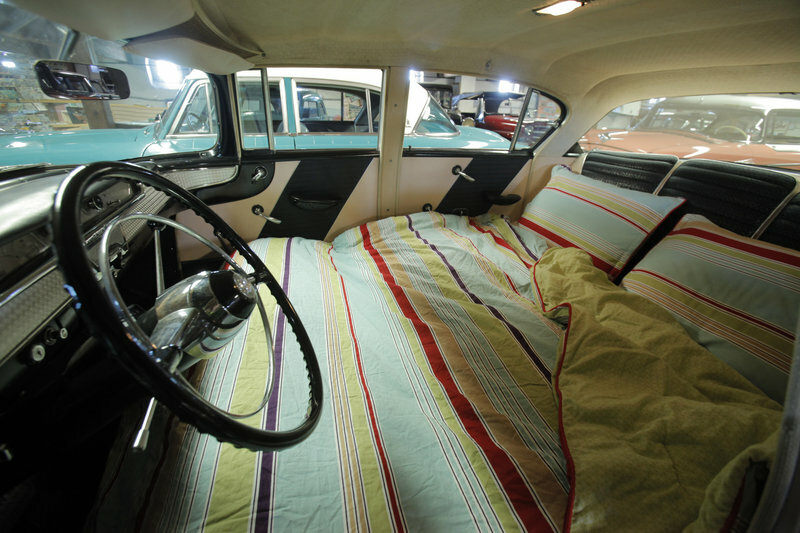 One of a number of “sleeper cars” manufactured in the 1950s, it is on display with the front seat folded down, covered in a quilt and pillows. The car was marketed as a way for drivers to save money on road trips, Stentiford said, which helped push the early tourism economy. In addition to the cars, Stentiford displays a variety of license plates and memorabilia, from Miss America pageants, presidential campaigns and automobile advertisements. “I want to use classic cars to drive Maine and American history,” he said. Stentiford hopes to acquire more vehicles made before the 1930s and after the 1970s, to fully represent each decade. Because the automobile is an integral part of American society, it’s an easy way to draw people into history, said Ethan Yankura, education director for the Owls Head Transportation Museum. He said the relatively recent period covered by Stentiford’s collection makes it special. “There are still a lot of people who are going to say, ‘I remember that car,’” he said. A collection of 35 cars is not unusual, Yankura said, but few personal collections are open to the public. And rarely do collectors allow hands-on access to their cars, he said.